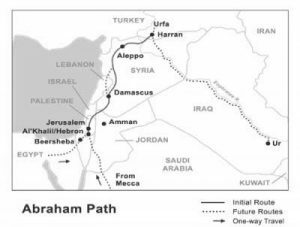 The purpose of the Abraham Path is to open up a route in the Middle East retracing the footsteps of Abraham. As the father of monotheism and the physical or spiritual forefather of Jews, Christians, and Muslims, Abraham is the unifying point for over three billion people who consider themselves part of the family of Abraham. The Abraham Path will serve to underscore and disseminate Abraham’s universal messages of oneness, faith, justice, peace, and hospitality toward all. Against a backdrop of conflict in the Middle East that has become a global symbol of intractable strife and despair, the Path and its televised images of imams, priests, and rabbis walking alongside one another will help inspire the imagination of millions around the planet with new possibilities for mutual respect. Parallel events will be organized in communities around the world in the form of local “Abraham Walks” from churches to mosques to synagogues, shared religious services and festivals, and educational events on religious coexistence. Economic: creating thousands of jobs by building infrastructure such as trails, hotels, restaurants, and providing guide services. Political: building confidence between states, for example, by opening up a path across the Golan Heights between Syria and Israel. Religious/cultural: restoring dozens of sacred sites along the route. Environmental: environmental preservation along the route, such as cleaning up the Euphrates corridor. Youth: providing a focal point for the idealism, energy, and adventurous spirit of young people from around the world.